After having Gary from klahanie (who hates blog hops) on my blog last month, I decided to switch tracks and have someone here who helped to create a rather fun blog hop that helps writers to share their work, get feedback, and build relationships. Today I have the lovely Denise Covey as my guest. Please help me welcome her! 1. Tell us about the blog hop Write…Edit…Publish and how you came up with it. Write…Edit…Publish (WEP) was the brainchild of Francine Howarth and myself in 2010. We called it Romantic Friday Writers to give romance writers a platform to work on their craft and receive feedback from like-minded writers. Good blogging friend Donna Hole partnered up with me when Francine’s career went gangbusters. We took the ‘romance’ out of the title as that is a scary word to some. Finally, with Yolanda Renee in 2015, we re-branded as WEP, where writers all around the world respond to set challenges with flash fiction, non-fiction, poetry, photography, and occasionally some great artwork. 2. 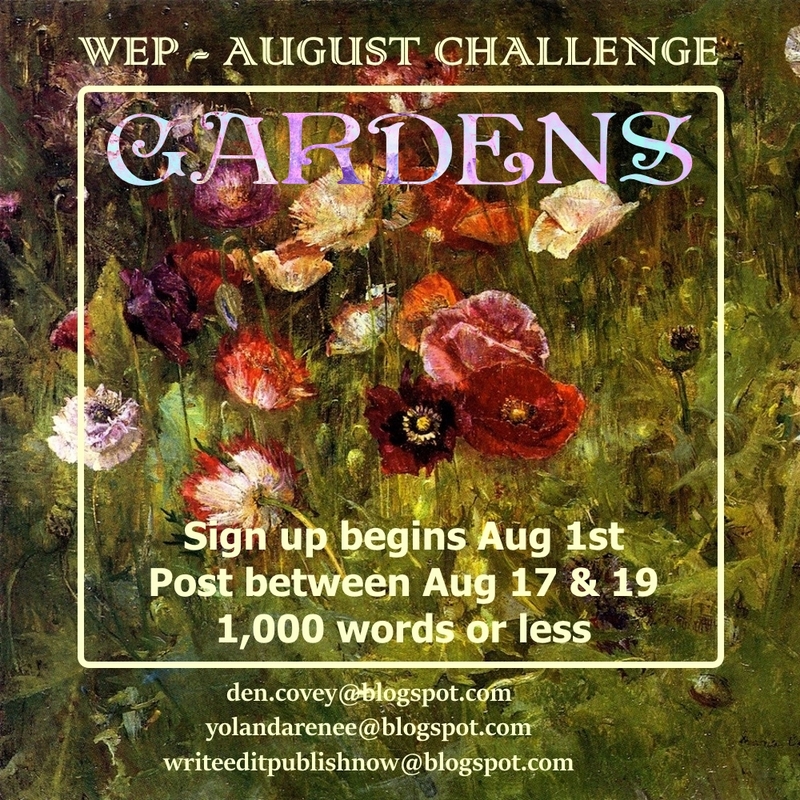 What is the WEP challenge for June? WEP has been a casualty of the A-Z challenge. Many of our writers were burned out, so we moved the June challenge to August. ‘Gardens’ is the challenge, and it can be tackled any way in any genre. 3. What was your very first blog post? My first blog post was titled ‘An Aussie Loses it in Genova, Italy’ in 2008. Travel post, of course. I got 1 comment. I still love that post even if only 2 people have read it, ha ha ha. 4. You travel to Paris a lot and blog about your adventures. What do you like most about this city? Paris was love at first sight for me. I’ll never forget flying over Paris and into Charles de Gaulle airport the first time. I usually visit every couple of years; I once stayed 6 months to work on my French-speaking skills! But…hard to say just one thing I like most about her, but I’ll try. Paris is a sensory feast—the architecture, wow, how design has always been upmost in the planners’ thoughts ever since Haussmann was hired to beautify the city in 1853. This attention to detail translates into a stunning experience when you walk the streets, linger for coffee and people watching along the Seine or enjoy a simple meal with excellent wine in the Latin Quarter, or just relax with a baguette on the stairs below Sacre Coeur in Montmartre and enjoy the view of the city laid out before you while you listen to classical musicians plucking at their harp strings. 5. You’ve taught English for years and share your current students' curriculum on your English Resources blog. What do you think is most important for kids these days to learn in English class? I don’t teach in the classroom any longer; I am a private tutor running my own business teaching English/English Literature at the State Library of Queensland. My students are predominantly international; currently they hail from Sri Lanka, Taiwan and Bahrain. I get the biggest thrill when a science-y student (aren’t they all?) confesses that he now loves English instead of hating it. I think it is so important for students to appreciate how a love of English—books, plays, poetry, speech, creative writing— can enrich them both present and future. The high school from which most of my students are drawn has Shakespeare on the curriculum in every year level, so if I can get students to love the bard, understand the history of the time, and the timelessness of good literature, I’m hilariously happy. Most-viewed in order…I got quite a surprise to see how many views I’ve had on some of the older posts I’d forgotten about, so this was a worthwhile exercise. Don’t get frustrated if you don’t get a heap of followers right off. It takes awhile to be discovered (there are ways to hasten this process if you are really into it), so just plug away, write good content, visit blogs like yours, leave comments, and you will find people often reciprocate. And as much as Chrys’ previous guest, the lovely klahanie, hates bloghops, these are a great way to promote your blog and show people who you are and, yes, to find new followers. And it is crucial that people find your blog easy to read. A new blogger can get carried away with cute, busy backgrounds, and fonts that are too small, too big, too white, too grey etc, so take care if you’re designing your blog yourself. Find some blogs you like and copy ideas. 8.30 pm Pacific Time (Brisbane). Both. Makes me more accessible. 3. Do you host guests? Sure. I love my guests. 4. Where are you when you’re blogging? Usually in libraries – Brisbane/Sunshine Coast. Denise Covey hails from that land Down Under, where she publishes flash fiction, short stories and travelogues in Australian magazines. When not writing, she teaches English to her rapt senior students who think it’s way cool to have a writer for a teacher. She loves writing edgy romantic stories set in Paris and currently has two Paris novellas under construction. Under the Tuscan Moon is her first, but not last, paranormal romance which she recently self-published. Denise has decided it’s way cool to live in a world of vampires and werewolves. Now she’ll have to invite them to Paris when they’re hunted out of Italy. Please leave a comment for Denise. Hi Chrys. Thank you for having me here for a few days. Enjoy yourself at Dear Unfocused Writer + Dear Writer with an Editor. I'll be over eventually. It's vital people love English - or whatever their native tongue - as reading opens so many doors. Hey, your most popular post is an IWSG post. That is too cool. Yes. People were all over that writing group post. We can do photos as part of the WEP challenge? I might join you in August then. It must be really satisfying to work with those students. Yes L Diane, photographs or photo essays are most welcome at WEP. Would love to see some work of yours in August. I love that photos/photo essays are part of WEP! Hi Hilary! We all have the things we love to do. I'm very fortunate that I'm able to travel and meet people and see amazing things very frequently. Good interview! I enjoyed Paris, too. There's a lot to do and see there. Seems the more I go there, Sherry, the deeper I'm drawn in! It's always interesting to see which blog posts are the most popular. That seems to be a blog topic on various posts the last couple days. We can never tell which posts will get the most views. Hi Liz! I never would have expected that post to be the most popular but who can predict what people like? Great interview, Denise and Chrys. I'm going to Paris in a month and this post made me even more excited to leave! My first time visiting and I can not wait. Enjoy your trip to Paris, Julie! Julie, soak up the atmosphere and love every moment. Hi Chrys and Denise. I've been speaking to a couple of novice bloggers recently, pushing the idea they need to get out and visit to attract people in - I joined every blog hop going in the beginning, which means I now have a lovely core of bloggers who will always visit. I've never been to Paris, I really should one day. Yes, blog hops are a great way to get established! Great post, Chrys. Giving awareness to what Denise does for our community is a wonderful thing. Thanks for your kind words Joylene. I love what I do. And Chrys was so sweet to invite me to her great blog. Excellent interview Chrys, Denise seems a wonderful blogger. Thanks for an interesting read. Thanks for your kind comments. Glad you found it interesting! Loving English is far better than hating it. Must have your work cut out for you getting some to like Shakespeare's tongue. You'd be surprised Pat. After awhile the language is music to their ears. I always love reading about you, Denise, and loved Under the Tuscan Moon. I hope many people discover it. Ah Paris, doesn't everyone dream about going there? For me, sigh, it'll have to be in another world. But we have the movies, and the wonderful stories. And travel articles by the likes of Denise Covey. Thanks for your kind comments re my paranormal romance Ann! I wish you could get to Paris Ann! 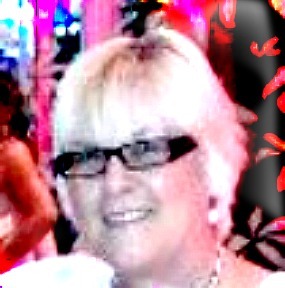 Hi Denise, wow, what a busy lady you are! I will check out some of your blog posts. They sound intriguing. I also LOVE Paris. I've only had the pleasure of visiting once but I hope to return in the near future. Your books sound lovely in that a. they're romantic and b. they're set in Paris! Great to meet you and thanks, Chrys for the interview. It's always nice to get to know another blogger and author. Lisa, what a lovely comment. I do hope you read some of those blog posts seeing it took ages to find the most popular, lol! I can't wait to finish my two books set in Paris. Lovely to meet you too! Hey Denise! Great to see you here. And Chrys, great interview, wonderful job as always. I just saw that Julie is going to Paris, I've got to see if she has room for me in her suitcase. Gosh, such a lovely place every picture is enticing. I can't imagine see it in person! Love the shout out for the WEP - again, thanks, Chrys! And Denise, I am so looking forward the the second story! Thanks for coming by, partner! We'll have to arrange a meeting in Paris in the near future. It's amazing to think WEP has been through so many incarnations and that you help so many people no matter what the name is. I read your impressions of Paris with rapt attention. My next project will be set in Paris and I have a LOT of research to do! Well LX, you know who to ask! Happy to help! I'll have to check out the hop! It sounds like fun. We'd love to have you Elizabeth! We love new people! I would love to visit New Zealand which is somewhat close to your neck of the woods. You've been a wonderful supporter through WEP's many incarnations, Roland. But it's been fun, hasn't it? We've all grown so much as writers and in confidence. Awesome to meet lovely Denise Covey here! And I loved reading this post from her, thanks Denise and Chrys! Awesome to see you here! Glad you liked the post! Most of my followers started off from blog hops, but the biggest thing IMHO is to get out there and participate. I see far too many blogs where the owner just posts stuff and sits back expecting traffic, with no interaction whatsoever. I agree. Not visiting/commenting won't grow your blog. You've got to be part of the community. Parisians appreciate our efforts. After all when I meet French people they speak English. Paris draws you in, but you have to make your own discoveries to make the experience your own. I prefer the rental apartments to hotels, but walking about gets you closer to the local Parisians and their luscious bistros! Our language skills were minimal but my persistence paid off. The Parisians we met liked our efforts at speaking their language, and gave us better service because we were at least trying. Not sure if areas outside of Paris would give the same response. . .
Nice seeing you here Denise! Lucky you, staying for 6 months in Paris. . . Yes D.G. you have to try to speak the language and it is much appreciated. It's been great to hang out here awhile! I've been participating in Write...Edit...Publish since it was Romantic Friday Writers. I must say, challenging yourself to write a story in 1,000 words or less can only improve your writing. I met Denise early in my blogging life. Right now, due to my health, I only blog a few timrs a month so I can concentrate on my writing. Denise has always been a huge support and good friend. Tou are as well Chrys. Lovely interview! My current WIP is actually set in Paris at the moment, though the story is set in about equal parts in Germany, Hungary, Poland, Italy, and France. For years, I didn't want to visit Paris because my eighth grade Spanish teacher says it smells like urine, and that put me off it so badly. Now I'd really love to visit France (Paris, Nantes, Béziers, Lille, Lyon, and several other cities), though I'm far better at reading French than speaking it. My characters are currently staying at Le Meurice (a palatial 5-star hotel), with their room and board paid for by a friend with disposable income. If I had the money, that's one of the Parisian hotels I'd stay by. Wouldn't it be lovely to have room and board paid for by a friend with disposable income. That could lead to a long stay indeed! I'm sure Paris used to smell of urine and dog poo, but they've cleaned up their act. My early morning forays to the metro show the street washing machines hard at it! France has so many gorgeous villages too and so many huge cities. Marseilles is more like being in Spain, but it is France's second largest city. And Carrie-Anne, I try to buy any book that looks good with 'Paris' in the title. Let me know when you publish. That's an interesting idea for a blog hop. I think I'd like to go to Paris just for the sweet baked goods. Yes Mary, always a daily treat! A travel writer surely has has the best job ever! I love flash fiction as it presents a great challenge to condense a satisfying story into a powerful sunburst. I already imagined Paris as brimming with creative inspirations and Denise you are living (and writing) proof! Thank you Diedre. Love my job! Especially when it involves Paris. Interesting group of international students! Thanks again for the Garden theme in August. That will be great. What I especially love is their thirst for knowledge and love of education. Not your average Australian student who finds education a bit of an inconvience. Great if you can join us for Gardens, Lee. Hi Denise! You are a role model to all those International students learning English and trying to adapt to a new country. Yes we have a great relationship which I will miss when I retire next year! Ah yes, I've finally arrived! Oops and of course, blog hops, blog fests, or whatever they are called this week, can have a great deal of thoughtful, interactive, proactive value. My lovely friend, Denise, you are a fascinating writer who has a fascinating life which you share with the blogging community. That's a most positive outcome. I don't do blog hops because I'd rather do my own thing. As for followers, I know that the amount of followers is not indicative of a blog's actual popularity. I would say that! :) Thus, blog hops may well be fine for bringing awareness via the blogging community. Me, I quite like being a well-kept secret, I state, ever so modestly! Excellent guest post, Denise. Strewth! Strewth Gary! Great that you hopped over! I enjoyed your interview very much and reading all the comments, too. It makes me so happy to read positive comments about Paris. I remember when I was in college in England how the British loved France but did not like the French too much. Then of course there are still people who are Francophobe. I do think Paris is one of the best cities in the world, but then I am prejudiced since it is my home town. I was thinking, when you teach English to the students, then they speak English with an Australian accent? When I came to the US my accent was part French with some British tones and words. Now people cannot really tell where my accent is from – last week at the deli the guy asked if I was from Russia. Usually people ask me “do you speak German?” and I reply “No, do you?” and that kind of stops them. Still during the Iraq war I never said I was French, I said “my father was Armenian” which is true and kept me out of trouble.